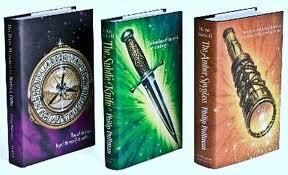 The three books are The Golden Compass (in the UK, this one’s called Northern Lights), The Subtle Knife, and The Amber Spyglass. These books are found in the YA section, but they are really books for adults because of the depth and complexity of their content. Set in an alternate world (though somewhat similar to ours), these books follow teenager Lyra’s quest to find out more about Dust, which is this particle in the air that attaches to adults but not to children. Dust is a symbol of original sin in the books, and Lyra is believed by some to be the new Eve. In the first book, children and their daemons are being experimented on by the “bad guys” (in these books, it’s the church – Pullman is an atheist). A daemon is sort of like your soul or spirit, but in these books it’s in the form of an animal who is always with you and can’t go too far from you. Lyra is given a “golden compass” that helps her read situations and get guidance as she tries to save these children. In the second book, she meets Will Parry, who got into her world through a “hole in the air” between parallel worlds. They meet Dr. Mary Malone, who is researching the Dust, and who may be able to help Lyra find her missing father. Will and Lyra find a special knife that can cut through air and open a window into different worlds, thus explaining how Will came through earlier. There’s a lot of things that go on in the second book so it gets complicated fast, but ultimately there are people who want Lyra to be killed so she can’t experience a second Fall or Dust. In the last book, Lyra has been kidnapped and Will is searching for her. Dr. Mary Malone has gone through a window into another world where she studies these strange creatures called mulefa and their special trees. Through a special spyglass she makes from tree sap (thus, the Amber Spyglass), she sees Dust even in this world, but it is leaving, not coming. Meanwhile, Will and some others rescue Lyra and they all travel to the Land of the Dead to find Roger, a little boy who Lyra helped in the first book. After that . . . well, no spoilers allowed here but a lot more stuff happens and by the end, Lyra and Will are in love, but there’s a bittersweet ending. Obviously I personally don’t agree with all the philosophical and theological ideas behind these books, but the books have so much in them to really make you think. They are about society and learning and belief and religion and philosophy and relationships and death and the soul . . . I can go on. I find it interesting that Pullman seems to be against the idea of original sin, but seems to believe that everyone has a soul. I wonder how he personally reconciles belief in the soul with the idea that religious belief is bad. To me, believing in a soul is a type of religious belief, you know? Anyway . . . these are great, deep, wonderful books . . . read them! BTW, Karla put these as her favorite YA books. Great minds think alike! What book makes you think? And here’s Karla’s answer for today.